OPERATIVES of Kogi State Police Command have arrested five suspects said to be behind the kidnap of a traditional ruler, a catholic cleric and the recent spate of robberies on Okene-Lokoja Road. Parading the suspects before journalists in Lokoja yesterday, Commissioner of Police, Mr. Ali Janga, said the suspects were also responsible for cattle rustling in Lokoja and its environs. Janga said one of the suspects was a member of a gang that kidnapped the Obaro of Jakura, Alhaji Ibrahim Adoga, and the priest in charge of St. Michael Catholic Church, Obajana, Reverend Father Leo Michael, on July 24. He said the suspects, who held the traditional ruler in captivity for five days, also killed his son. 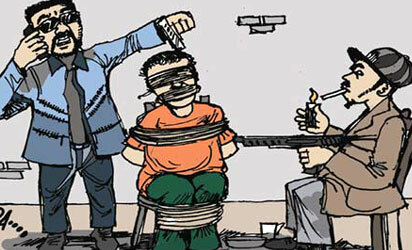 According to him, “one of the suspects, Ibrahim Musa, who was part of the gang which abducted Father Michael at Irepeni village along Lokoja-Okene Road and Chief of Jakura, gave useful information to the Police. “The command is on the trail of other suspects connected with that incident,” he said, adding that N240,000 suspected to be part of the suspect’s share of the ransom, was recovered from him. The commissioner said the Police were on the trail of other members of the gang, noting that the suspects were also responsible for cattle rustling in Lokoja and its environs, and that the suspected buyer of the rustled cows had also been arrested. The suspected buyer of the rustled cows said he only bought two cows from the suspects in June. Janga said the suspects had confessed to the crimes and would be charged to court soon.